After our small van wound up and down narrow roads through beautiful terraced Guatemalan farmland, we reached the sign for Hotel Atitlan and Botanical Gardens. The van turned slowly down the dirt and stone road. We saw a sign for the gardens, indicating there was a fee for day use. As we approached this grand hotel we caught a glimpse of the flowering vines and beautiful landscaping. We were in for a treat. We were quickly checked in and we admired the lobby. As I went to my room, I saw more botanical specimens hanging from the railings. Interesting antique carved wooden furniture and images were placed all along the walkway. I entered my spacious tile-floored room and was awestruck by the view. I had a balcony (as do all rooms) overlooking amazing Lake Atitlan and volcanoes! Leading to the lake were even more beautifully manicured gardens. The room was beautiful but the lake is what would draw me to sit and relax every day during our stay. This evening the lake was quiet, showing just a few ripples as small boats passed by. 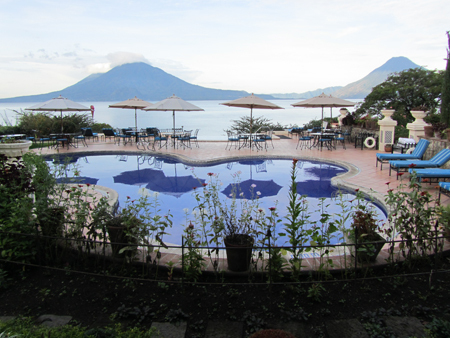 Hotel Atitlan is located on the shore of Lake Atitlan outside the town of Panajachel. This is in the western highlands of Guatemala, just a few hours from the airport at Guatemala City. If you want to take a helicopter to the resort, the flight would be about 30 minutes and you’ll land right at the the hotel’s lakeside helipad! The views from Hotel Atitlan include three 10,000 ft. volcanoes – Toliman, Atitlan and San Pedro – towering above the lake. The Gardens, located in both front and back of the hotel are an amazing place to explore. There are different gardens, each with its own identity located on the property. There are paths with surprises at each turn. One morning I ran into a pet lop-eared rabbit contentedly munching grass. As the water level of Lake Atitlan has receded, the garden have expanded in a series of terraces and are divided into colorful tropical gardens, formal rose gardens and surprising succulent gardens. Pathways wind around the hotel revealing extensive collections of Roses, Hibiscus, Heliconias, Passion Flower and Bougainvillea, with over 500 different species representing 250 plant families. Brilliantly colored Macaws graced the trees close to the rooms. The gardens make the hotel a tropical paradise rivaling anything I have seen in Hawaii. The Hotel Atitlan has 60 tastefully decorated rooms, ranging from singles to suites. Rooms include spacious balcony, telephone, hair dryer and television. Bathrooms are nicely tiled. My room had a shower, but no bath tub. The hotel features a beautiful pool and large hot tub with infinity edge overlooking the lake. What a place to be at sunset! Each morning our group gathered for breakfast and were treated to outdoor dining (indoor was also an option) overlooking the pool, lake and gardens. The table was set in south-of-the-border colors and the food was excellent. In the evenings, we could sit in the comfortable bar for a pre-dinner cocktail and then adjourn to the spacious dining room for an excellent meal. The menu including offerings of fish, beef, chicken and salads. Most of the fruits and vegetables are organically grown in farms adjacent to the hotel grounds. Although it is hard to leave this tropical paradise, there is much to do within a few minutes away, or a boat-ride across the lake. The hotel advertises that you can do an “X-treme Cable Adventure,” go scuba diving or visit the butterfly garden in season. But what we enjoyed was taking the boat (arranged by the hotel) across the lake to the villages. You can visit lakeside villages where the women still wash clothing on the large rocks on the shore, villagers make the traditional woven clothing, and you can visit a pottery factory. 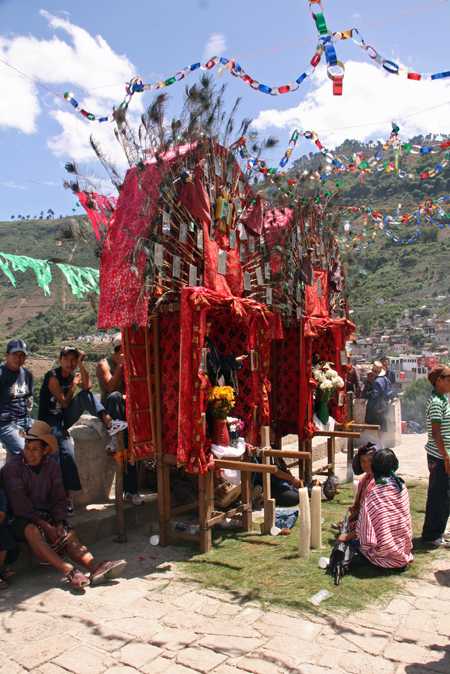 Each village offers something different, has a unique mode of dress and, if you are lucky, you’ll encounter a colorful festival. Most of these villages are culturally intact and your visit will provide you with a fascinating look into Mayan life. List of villages and day trips. Forget Hawaii! Go to Guatemala. The tropical paradise we enjoyed at Hotel Atitlan rivaled any gardens we have experienced in Hawaii. While there is no ocean, there is a beautiful lake and swimming pool at the resort. Hotel Atitlan is a quiet getaway where you an unwind and relax. Yet it is close to shopping, restaurants and fascinating Mayan villages. 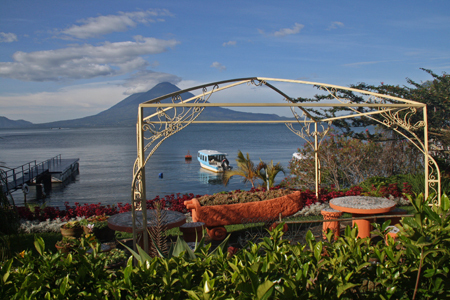 As I looked at the grounds and the gardens, I thought that Hotel Atitlan would be ideal for a destination wedding. It is that beautiful! The prices, compared to hotels in Hawaii, are rather low. I suppose the only drawback is that you will have to negotiate immigration and customs lines coming in to the country and returning to the U.S.